Jon Burgerman's Instagram joke ended up in the Tate Modern. But how should you go about the creative process? Where do you start? For Burgerman, creativity isn’t about making elaborate plans or thinking ideas through before putting pen to paper. "If you don't have a plan, then you can't go wrong,” he said. “Throw away your map, and then you'll just be there." To create his bright and fun characters, Burgerman just starts, and finds out what he’s going to draw as he goes about drawing it. “Doodling is thinking and making at the same time,” he said. He also doesn’t believe that you need a lot of tools for creativity, and states that once you strip back all the things you think you need to create, all you’re really left with is the need for restrictions and time. “That’s why so many rich people make bad stuff, because they’ve got no restrictions,” he laughed. Imagination is also important. "Allow your imagination to be your raw material,” he advised. “It's not about what tech you have." 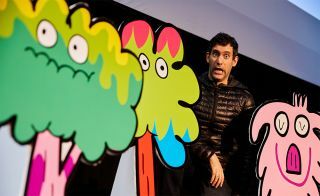 Talking the audience through his range of quirky jokes, experiments with Photoshop and Instagram stories, Burgerman reminded attendees that once you put something out there, you don’t know how it’ll be received or what you’ll end up doing with it. “What starts as a gag becomes a little collection,” he said, talking about a series where he put his image next to those of celebrities, lined up as if he was part of the photo. And of course, what’s popular in one place may not be popular elsewhere, as he found when he drew doodles over images of people on the subway in South Korea. He received a lot of comments saying that taking pictures of the public was illegal, which only served to impose another restriction on him and make him come up with new ways to do his project. “You make one thing in one place and then you take it to a different place and it can be reinterpreted,” he said. Burgerman uses Instagram a lot. “It’s like a digital sketchbook that anyone can look at it.” He finds that Instagram Stories are particularly good, “because they’re just you experimenting, and a day later they’re gone. They teach you not to be too precious,” he said. And Burgerman is proof that seemingly small experiments can lead to big achievements. His “stupid pointless stories” have even made it to the Tate Modern. New opportunities are constantly arising for Burgerman, who has recently been asked to ‘Instagram Story’ an event. “If you keep changing what you’re doing, you can invent new ways to make a living,” he said. So keep on experimenting, and putting your work out there, and perhaps one day you’ll be paid to doodle over people’s heads. thread is a series of creative events. The thread team are also organising new festival Something Good, which takes place on 6-7 October in Bristol. Tickets are available now from www.somethinggoodbristol.com.